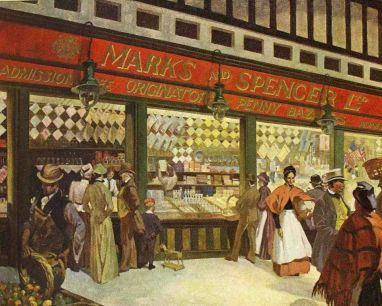 Trace the origins of M&S as a Penny Bazaar. In 1884 Michael Marks started business as a pedlar in the North East of England, selling small items for a penny each. Marks prospered and was able to set up a market stall in Leeds. He stuck to his fixed price policy and the Penny Bazaar was born. Partnership with Tom Spencer followed, as did expansion across the country. Discover Penny Bazaar merchandise, photographs and early business papers.